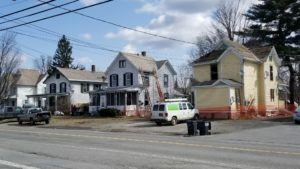 Demolition of three homes on Quaker Street to make room for a new Stewart’s Shops store and gas pumps was completed Monday. 50, 52 and 54 Quaker Street prior to being demolished. One-by-one the houses at 50, 52 and 54 Quaker St. were picked apart by backhoes and carted off on dump trucks. Construction of the new store is scheduled to begin April 23. Asbestos abatement was completed during the last week of March. Demolition began last week. Some of the material from the homes, including the slate roofing, Marshall said, was salvaged. “There were definitely some components that people sought,” he said. The company, which operates a small store at 56 Quaker St., purchased three neighboring lots to the north of its current store for a new, larger facility with fuel pumps. The existing store will remain open during construction.